Explore the ocean with the Full Face Snorkel Mask from Deep Blue Gear featuring a next-generation, all-in-one mask and snorkel design that enables you to breathe naturally through your nose and mouth. 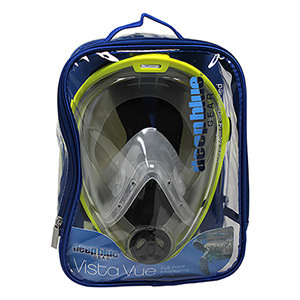 Offering a refined design of the air flow and purge valve system based on feedback from customers in the Caribbean, the Full Face Snorkel Mask ensures optimal comfort, easy ventilation, and fog-free undersea viewing. Eliminating the need for a snorkel mouthpiece, this Full Face Snorkel Mask has an integrated dry snorkel tube at the top of the mask that stops water from getting into the mask. The large diameter, single chamber snorkel tube with innovative multi-purge valve technology allows air to be easily inhaled and exhaled -- comfortably and naturally. Fresh, dry air is continuously directed across the inner surface of the mask, preventing condensation from forming and reducing fog. A crystal silicone skirt provides superior comfort with a clear, panoramic view. Elastic straps are easily adjustable, allowing the mask to be comfortably secured to your face.